Nothing beats a warming bowl of soup on a cold winters day, it’s great to have for lunch or for a light evening meal. This recipe is one of my old favourites and was originally from a 1985 cookbook written by two wonderful flamboyant chefs, Hudson and Halls. For the past twenty years or so I shunned using the amount of oil and butter recommended in the original recipe. Even though the soup tasted great with the scant spray of oil that was allowable to me under the old way of eating, being able to go full fat gives the whole dish not only richness and depth, but an honesty to the original creators. Slice pumpkin into 8 pieces, de-seed and place in a roasting dish. 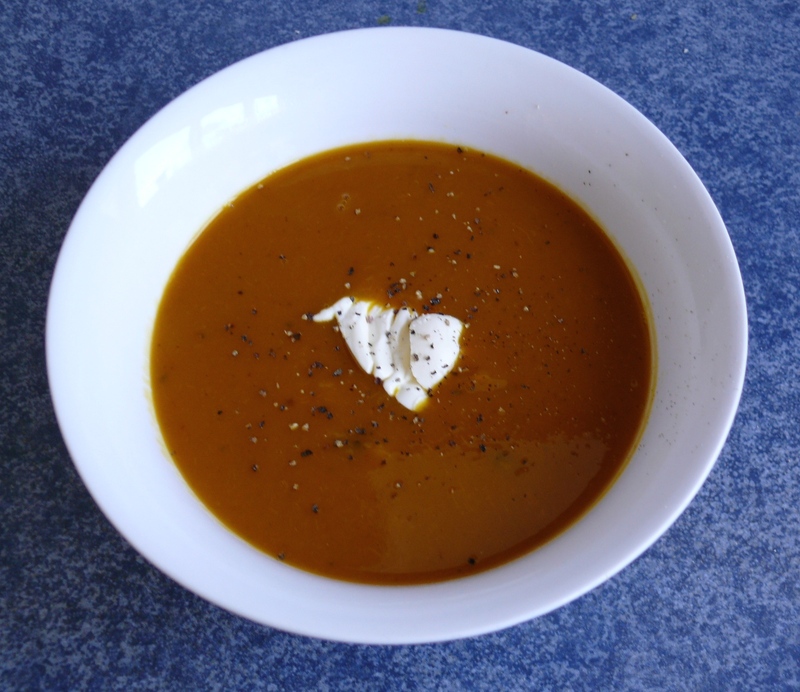 Coat pumpkin with 2 tbsps olive or coconut oil. Remove and leave to cool a bit, then remove the skins. In a large saucepan heat the butter and remaining oil. Add the onions and cool gently until soft but not brown. Add the sliced garlic and cook another minute. Add roast pumpkin and stir fry for a minute. Add the curry and cook until the flavour has burst – another minute or so (the curry will smell great!). Add chicken stock and bring to the boil. Finally add bay leaves, salt and pepper. Lower heat, cover and simmer for about 15 minutes or until the pumpkin is very soft and mashable. Whizz in blender or food processor until the soup is as smooth or as chunky as you prefer. Return to pot and stir well. Check seasonings adding more salt and pepper if needed. Place in bowls and swirl in sour cream. * It is easy to make your own chicken stock and gives a huge nutritional boost to the soup. You can do this ahead of time and freeze. However, if time is short use a good quality store bought chicken stock, but check the ingredients carefully. I love pumpkin soup but have always struggled cooking with pumpkin! It goes everywhere, on the walls, on the ceiling… Inspired to try again by seeing this though! Awesome comment, and yes, I agree, pumpkin soup can do well on walls and ceilings:). Try to keep the soup to a low simmer,cover the pot, use a cup to transfer to the food processor and also keep the spout covered. Hopefully that should minimise the splash factor!